A Proven Design for Trapping Slugs & Snails With Great Success! A Sure-Fire® Product Brought to You by Woodstream, Inc.
What is The Pit and How Does It Control Slugs & Snails? The Pit is a lightweight, round container that is designed to hold bait that attracts slugs and snails. Made of green plastic so that it is relatively inconspicuous set in the soil among plants, it has a raised snap-on lid that permits slugs and snails to crawl up and over its rim to enter the trap while it still protects the bait from rain. This cover is easily removed to facilitate cleaning and re-baiting the trap. The Pit is suitable for use with several kinds of bait, but the most common and non-toxic is beer (non-alcoholic beers are even better). The fermented yeast in the beer attracts the slugs or snails and they fall into the trap and drown. A dough made of 1 Tbs. molasses, 3 Tbs. cornmeal, 1/2 cup flour, 1/2 cup water and 1/2 Tbs. yeast ,which keeps well in the refrigerator, is recommended by Organic Gardening Magazine. Setting up the trap: The Pit comes in packages of three. 1. Dig holes in the soil so you can sink each trap below level, its rim even with the soil surface. 2. Bait traps with beer or 1 teaspoon of baking yeast dissolved in 3 ounces of water. 3. Locate the traps in planted beds where slugs or snails are chewing holes in plant foliage. This is likely to be where soil is moist and somewhat acidic. 4. Empty traps and provide fresh bait every three or four days for best results. Set The Pit out early in the season where slugs or snails were a problem last year. It will trap early arrivals, alerting you to their presence before their damage is obvious. Then set out others immediately. After two or three weeks slug populations are reduced enough so that natural predators can control them over the season. After two springs in a row, you will restore the balance between the slug population its natural predators in your yard. 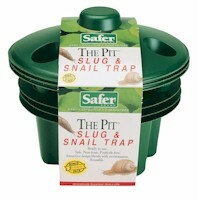 Deploy The Pit early in the growing season to trap young slugs or snails before they can reproduce. Do not wait until plant damage is heavy and obvious. Use lots of traps--one every ten square feet of plant area is good. Locate them just outside the area under attack to lure slugs and snails away from their target plants. Clean traps daily for at least a week. Dead slugs smell and warn away other slugs. Beer or yeast that is fresh attracts them best.